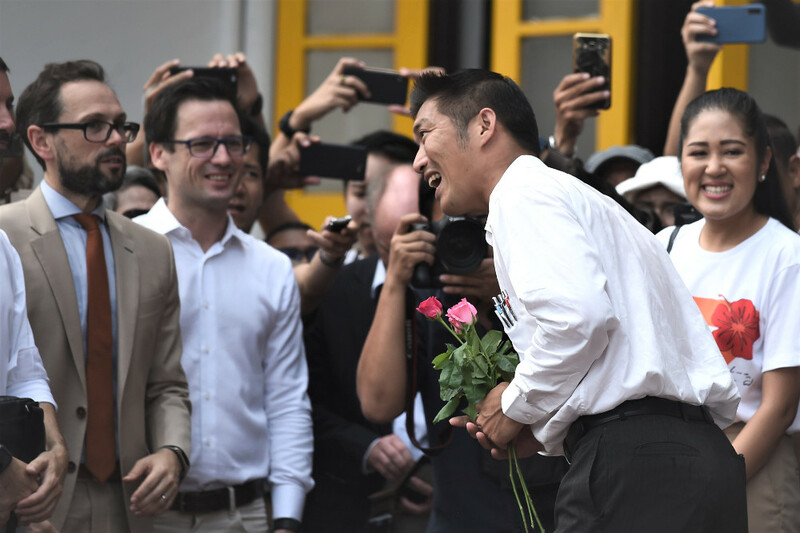 Thanathorn Juangroongruangkit, the leader of Thailand’s Future Forward Party, speaks to foreign officials as he arrives at the Pathumwan police station in Bangkok to hear sedition charges brought against him by authorities, April 6, 2019. After the Thai foreign minister criticized officials from other countries for showing up at a Bangkok police station as an opposition leader answered a summons, the American embassy and European Union mission responded Wednesday by saying it was standard diplomatic practice to send observers. Don Pramudwinai, the foreign minister of Thailand’s military government, had lashed out Tuesday at various foreign embassies for dispatching observers to watch while Thanathorn Juangroongruangkit, leader of the Future Forward Party, arrived at the Pathumwan police station on Saturday where he was charged with sedition and other alleged offenses. Don accused the foreign missions of breaching diplomatic protocol and interfering with Thailand’s judiciary system. “The U.S. Embassy regularly attends court proceedings in high profile cases around the world in order to observe fair trial guarantees and respect for rule of law,” embassy spokeswoman Jillian Bonnardeaux told BenarNews. The meeting was convened at the ministry’s request, she said. Officials representing several nations including the United States, as well as the European Union (E.U.) and United Nations human rights officials, met Thanathorn outside the police station, according to press reports and Thanathorn’s supporters. Diplomats from Australia, Belgium, Canada, Finland, France, Germany, the Netherlands and Great Britain were also present at the police station, according to reports. The Future Forward Party leader was charged with sedition, aiding criminals and taking part in a political gathering of at least 10 people four years ago, when the Thailand’s junta had outlawed large assemblies of a political nature, officials said. Thanathorn’s party, which is popular with young voters, won 30 of 350 parliamentary seats that were contested in the March 24 general election, whose final and complete results have yet to be made official. The polls marked the first election in Thailand since the military seized power in a May 2014 coup. “Observation of hearings and trials is standard diplomatic practice worldwide. Its purpose is to enhance understanding of adherence to international standards such as human rights and due process,” the spokesperson said. Busadee Santipitaks, director general of the Thai foreign ministry’s information department, meanwhile confirmed that its deputy permanent secretary, who is responsible for handling relations with foreign missions, met Wednesday with officials from the U.S., E.U., France, the Netherlands, the United Kingdom, Germany, Canada, Australia, New Zealand, Finland and Belgium. The deputy permanent secretary conveyed to them the ministry’s “disappointment and worries about the presence of representatives of foreign embassies at the Pathumwan police station” as Thanathorn responded to the summons over the weekend, Busadee said in a statement. The foreign presence there in particular “created an image that can be interpreted as encouraging to Thanathorn and taking sides in the Thai political context,” the ministry’s spokeswoman said, alleging that the showing had breached diplomatic practices and interfered with Thai internal affairs. “Therefore [we] asked the embassies to take steps to prevent this from happening again,” Busadee added.